The recent Ushaw conference on the celebration of the 1962 Latin Rite set me off thinking again about veils. 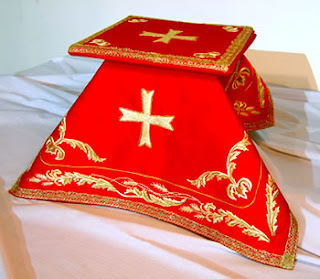 Some years ago - before I was even interested in the 1962 Rite - I became convinced that I should use the chalice veil for Mass, and veil the tabernacle. At the time I couldn't have put this conviction into words; it was almost a gut reaction. Thinking back on it, I remember that part of the background to this was my disappointment over some modern churches. Some of them are almost clinical in their architecture and decoration. I am thinking of one in particular which seems to be all metal, corners and hard surfaces. One of the thoughts that occurred to me at the time is that when a few insistent voices are being raised about the possibility of women priests and the need for greater recognition of the place of women in the Church (how could we not notice them? Where would our daily Mass attendance be without them?) Bishops, Apostolic Vicars and architects are making our church buildings look even more masculine. There's no sense in it! But it's not only that; there is something missing in a church or liturgy without veils, fabrics and, or, curtains. I know that in some churches even chasubles are left in the sacristy press (unless the Bishop comes!). Why does everything have to be hard, sharp and bland in so many modern churches? I have often puzzled over this. Has it something to do with a desire to distance ourselves from the exuberance, or even triumphalism, of the past? Why is colour no longer thought tasteful? Why did ornament disappear? What strange authority decided that "noble simplicity" meant colourless? I know about architecture's obsession with light. I can appreciate a well-lit building, and there's nothing so atmospheric as a church interior dressed in daylight. But why do we have to be so penny-pinching and -well, bland? Back to the veil. At the offertory of the Tridentine Solemn High Mass, the Sub-Deacon takes the veiled chalice and paten to the celebrant using a humeral veil. After the host has been placed on the corporal, the Sub-deacon takes the paten from the Deacon and holds it beneath the humeral veil whilst standing behind the Deacon and the Celebrant. Why does he do this? When I saw it, I instinctively connected it with the Orthodox use of veils and the "great veil" itself - the Iconostasis. There is something in this, but we also need to remember that not too long ago, the chalice, paten and other Eucharistic vessels were considered "sacred" because of what they held. These things were not to be touched by anyone and everyone (as it seems there are today in most places). It is interesting that in some places in the Western Church there is a return to reverence for holy things, and not just because of the celebration of the Old Rite. The fact is that some people in the Catholic Church are "thirsty" for the sacred and they are beginning to show reverence wherever they think it is appropriate. This may be part of the reason for the growing interest in the Old Rite. Of course, the veiling is not just about the sacredness of the vessels themselves. Looking at the antiquity of the Byzantine Rite it seems obvious that the practice of veiling in order to reveal something of the "mystery" began in the earliest years of Christianity. Perhaps something was adapted from pagan practices, but we can never forget the ceremony and ornaments of the Jerusalem Temple and, before that, the Tabernacle in the desert. Without doubt, the early Liturgy borrowed elements from the Jewish practices, and these should not be despised today when our increasingly secular and pagan world is dying for lack of the sacred. Why should it be thought that everything in the Liturgy has to be seen and heard? In recent years the Holy See has reminded us of the need for silence in the Liturgy. Not only that, but the modern Rite is too "wordy" whereas its ceremony leaves much to be desired. It is as though we have finally succumbed to the intellectualism of the Enlightenment and forgotten the importance of gesture and ritual. it seems almost laughable that there has been an attempt to introduce dance into the Liturgy whilst, at the same time, the "dance" of the Solemn High Mass has been removed. Veiling says something about the importance of not seeing. In the Old Rite, the vestments themselves act as veils because the priest or bishop has his back to the people because he is eastwards-facing. Some things are hidden from sight. This is obviously an early development and is still continued in the Orthodox Liturgy. It became clear to me whilst looking at the actions of the Solemn High Mass that the Roman Rite contained its own "iconastasis". Not only are certain things hidden from sight, but some things are not heard. Does this mean that people in the pews are deprived? From what I have seen recently - and that includes hearing the opinions of people who have attended the Old Rite Liturgy - any deprivation they suffer is because of the way the Ordinary Rite is sometimes celebrated, and because so many in our churches do not know how to use silence. There are so many other things to say, but I will leave the matter here for now. I would just like to say again that Western Christians have much to learn form their brothers and sisters in the "East", and perhaps, looking at the Old Rite, we have much to learn from what has gone before. It is surely part of the Holy Father's intention in the Moto Proprio that we should be open to these things. A very interesting post Father. Mosebach has an excellent section on veiling in his book The heresy of formlessness.